Automakers continue to reconfigure their product portfolios to account for the rise of crossovers. Cadillac, like everyone else, understands the necessity of freeing up production in order to build the vehicles their customers crave. The ATS sedan now becomes the latest casualty of the crossover era. Launched in 2012 for the 2013 model year, the ATS became the entry level Cadillac after the company raised the price of the CTS to a level more appropriate for its size. While the ATS is a good looking sedan with excellent driving dynamics, it competes with the BMW 3 Series and the Mercedes C-Class, two vehicles that routinely define the segment and carry far more cachet than the Cadillac ever could, likely due to their longevity. This screenshot from Good Car Bad Car tells you everything you need to know about the state of the ATS. As recently as March 2018, the Cadillac was selling far less than the 3 Series or the C-Class. And who is the primary buyer of an ATS these days? Probably GM diehards or individuals who want a luxury sedan from an American automaker. Those customers also have other options as well: the Lincoln MKZ, which is bigger and sports a base price only 100 dollars more than the ATS. There’s also the elephant in the room: Tesla’s Model 3, which is starting to be produced in increasing numbers. It still has well over 300,000 pre-orders. And if an ATS is the only vehicle for you, you have more options when you consider pre-owned models. I opted to search for 2016 and later model years variants because that is when GM outfitted the sedan with an 8 speed automatic transmission. It’s not outside the realm of possibility that you could pick up a lightly used ATS for about the same monthly payment it would take to lease a brand new one. American automakers are quickly realizing that competing in rapidly declining segments with well established players isn’t worth it. Is the CTS also on borrowed time? Probably. Cadillac’s current conundrum is the dearth of crossovers in its lineup. An XT4 is on the way, but that still leaves a considerable number of gaps in the lineup. Lansing Grand River Assembly is likely replacing ATS sedan production with a crossover. Oddly enough, production of the ATS coupe will soldier on for now. Perhaps this sells in numbers that make it financially viable in the short term? Who knows. But don’t be surprised if this also gets cancelled. Perhaps a crossover coupe will replace it. It’s sad as this is a really good car. honestly, as much as i love Cadillacs……….I am really tired of the Art and Science look. They need a new direction and they need to stop teasing us with those beautifull concepts, grow some balls and produce them!! They look like an Isuzu D max pickup, exactly the same styling cues grille shape headlight shape, though I guess those are not sold on the US market. Is that a Camry or a Caddy? That’s what I’ve been saying since it came out, but some folks don’t take to well to that comment. Of course the Camry has moved on to a whole new design since then. I hate to come across as a GM hater (which I’m really not anymore), but I was utterly underwhelmed by the ATS when it came out and I did not see it making any serious inroads against the competition. I don’t think anyone could reasonably call you a GM hater. You, along with a lot of us, are just so utterly disappointed in how little GM even tries anymore. It is like watching a gifted talent just sitting around doing something else instead of using the special gift they have. How the former leader of style and value regularly offers neither is beyond me. My thoughts are kind of mixed on this. On the one hand, I’m not a Cadillac fan and the ATS never struck more than a second of interest in me when it first came out. Yet on the other hand, I can appreciate the effort they put into making their best attempt yet at a 3 Series competitor. IMHO, they got about 80% of the way to building a great 3-Series competitor. Stuff like the cheesy instruments and cramped rear seat turned away people, even if the the chassis was amazing. And no, neither of those would bother me personally if I found a good deal on a gently used ATS, but I’m not the one buying it new. It is always dangerous to assume that the rest of the world has tastes identical with mine, but perhaps this time it does. I cannot think of a vehicle that would hold less appeal for me than one of these. If I am going to get a small sedan I would certainly not get one from Cadillac. And I would certainly not spend that kind of money on it. A large sedan or a crossover or an SUV could be a different proposition, but an ATS is just silly in my world. It is amazing that Cadillac has been working on trying to regain some market credibility for, what, 10-15 years now? I don’t know about you all, but I am not really detecting any movement. The movement is negative, in the US, as Cadillac sales continue to slip. In China, it’s a whole different story. Sales are up very strongly this year, once again. And there’s a lwb ATS available there, oddly enough. Long wheelbase cars are almost always chauffeur driven in China. I had a lwb Passat with a driver when I lived in Beijing. Yes, I’m very aware of all of the lwb versions of so many cars that are available in China because of chauffeurs. I was being tongue-in-cheek, when I said “oddly enough”. It’s not odd at all. Yeah, I guess the old saying “Nobody is a prophet in his own country” could apply to Cadillac. Question asked: Is the ATS a modern Cimmaron? I don’t think you can compare the ATS with the Cimarron in any way. The ATS sells better, was purposely designed as a compact luxury sedan, and is competitive with its rivals. The Cimarron was a pathetic joke. Well, no, since it is not a bebadged Chevy 4 door, but then again, it does share the Alpha platform with Camaro. If this was out instead of the Catera in 90’s, maybe would sell better? Now, a S/CUV is the “mark of success” to upper class, and a “small car” is not. The ATS was the first to be produced with this platform. The CTS was introduced the following year and then the camaro. No, but the Escalade is a gigantic modern Cimmaron. We are most of the way there, but I am still trying to get used to the idea of having nothing to chose from but CUVs or SUVs, and I almost forgot: huge pickup trucks. 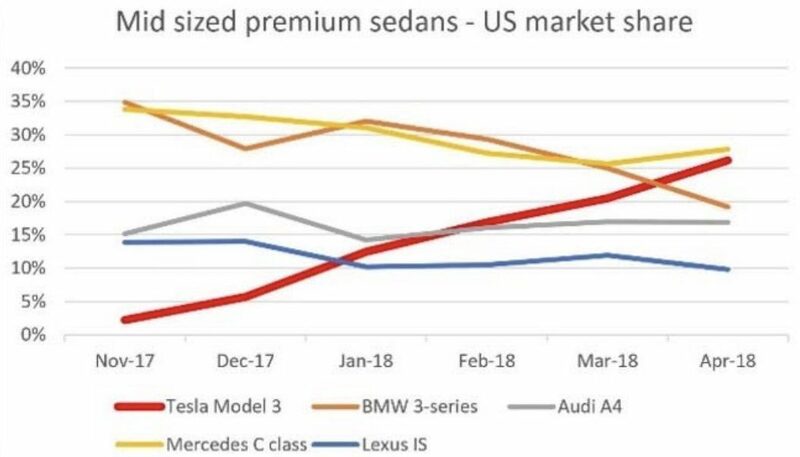 Speaking of the Tesla Model 3, they released a chart that seems to substantiate their claim that it will be the best selling sedan in its segment very shortly. Note the strong drop-off of the BMW 3-Series, whose owners are presumed to be the #1 source of all those Model 3 reservations. They didn’t even bother to include the ATS. Rewind back to the days of the first-generation Lexus IS and it wouldn’t have been included in such a chart as it took until the second-generation for the nameplate to make any headwind. A Cadillac this small is still a new and strange concept to some people. If GM continues to commit to this segment, perhaps they’ll see some growth. Cadillac benchmarked the E46 3-Series for the ATS and nailed the driving dynamics. Unfortunately, they didn’t account for two things: the changing automotive landscape and the rise of Tesla, as well as the fact many buyers in the segment probably don’t care all that much about pure driving excitement. The 3-Series has gotten larger and, with certain option boxes left unticked, softer. It sells because it’s a damn good car, of course, but also because of that badge that has more cachet with luxury car buyers than Cadilac’s. Cadillac therefore was offering something smaller, with less cachet, at almost the same price. I’m cautiously optimistic that a repositioned ATS replacement will do better in the segment. It’s too early for Cadillac to go toe-to-toe with the Germans on price, they still have to worry about finding a USP. With a caveat: BMW sells because it is a damn good car during its warranty/lease term. Then the same type of things that hurt GM start to occur: failing sensors, cracking/bursting plastic coolant expansion tanks, etc. As a former owner of an E46, I speak from experience. But when one needs the cargo capacity of a wagon, there are few options other than BMW/Mercedes/Audi or Volvo. I have to disagree. Cadillac has a long history of small cars, all craptastic at best, all negatively received. Cimmaron, Catera. Some may even say Seville, but it did sell better and was marginally larger. This goes back to the late 70s, so it is not a new concept. The reality of the fact that they tried with the ATS is truly amazing. It reiterates the definition of insanity: doing something exactly the same and expecting different results. In the USA, the main market for Cadillac, small equals cheap. Period. Full stop. No ands, ifs, ors, or buts. A small Cadillac will sell in other markets, but it will only sell in North America in any volume if it was 50% cheaper than the equivalent German or Japanese models, and it was not. Nothing against the car, but the intended market for this car never existed. You want real luxury status? Buy a BMW 3. Other than magazine reviewers and fanboys, this did not have a viable demographic that was willing to actually lease or buy in any volume. “will be … very shortly” When? Until the actual cars are built and sold, then they can have a party. But, still saying “pretty soon”. Sounds familiar. The last entry on that chart is for April 2018; that’s actual history. And as you can see, in that month the Model 3 was actually only very slightly behind the C-Class. And the actual trend line is pretty obvious. And Tesla has been actually building more Model 3s per week in late April-early May than in early April. Is that “actual cars” enough for you? Never mind; don’t let actual facts get in the way of your opinions. Here in Santa Cruz, where the Model S isn’t uncommon, but not nearly as prevalent as it is “over the hill” in Silicon Valley, I have started seeing Model 3’s quite regularly. Biking around town yesterday running errands, I saw three of them. I have noticed perhaps two ATS’s in the past month. I’m seeing Teslas around here which model I’m not sure as I dont follow their updates or anything but the cars look quite good, one overtook me a couple of days ago and other than tyre noise no sound, made me look real hard at it as it disappeared around a curve, he/she wasnt going fast but I was grossing 46 tonnes and still in low box pulling away from an intersection, cool cars though well over $100k to buy here. I like the ATS – it’s my favorite Cadillac. I would never get one though because of the dealers attached to them. Why spend that much money on a Cadillac when they can’t even provide proper service for a Sonic? I’ve dealt with 3 GM dealers in my area and the experience has been quite negative. That’s why Project Pinnacle is so important for Cadillac. I hope it doesn’t fade away under Carlisle, the new leader. Sure, dealers might be upset but if you want to sell a luxury brand, you have to offer the same kind of service and experience as other luxury brands. But unlike FoMoCo, Cadillac is replacing 3 sedans (ATS, CTS, XTS) with 2. And with the “flagship” CT6, that makes 3 total. And let’s see how long before there’s another sedan consolidation. None of them are selling at all well. This sort of parallels what Acura did in replacing the TSX and TL with the TLX. While it may have simplified their model range, it sure as hell didn’t produce a better car than either of those two were to begin with. In my opinion, it actually took the worst of both of those models and ended up with the TLX. What happened to the company that produced my beloved 2005 and 2008 TLs?! Let’s not read too much into this, Edward. By 2020, Cadillac will have the CT5 which will once again be tweener-sized: priced closer to a 3-Series, sized closer to a 5-Series. Considering how GM has been committed to keeping their cars light, I’m optimistic the CT5 will be uniquely positioned in the 3/C/A4 segment. There are still plans to slot a new sedan underneath it, priced close to the BMW 2 and Audi A3 but sized closer to the 3 and A4. It’s unclear whether this car will be called CT2, 3 or 4, however all reports indicate it will continue to use a rear-wheel-drive platform. Interesting as that (2/A3) segment is moving towards front-wheel-drive. Unfortunately, Cadillac finds themselves with a glut of sedans as the market turns against them and they’ve been slow (indeed, slower than Lincoln) to respond. It was crazy that for a while there, there was only the SRX and a giant chasm between it and the truck-based Escalade. However, the XT6 is coming by 2020 and it will be a three-row version of the XT5. I’m still holding out hope for an Omega (CT6)-based full-size crossover, or something on Alpha. My crossover tastes tend towards the more performance-oriented: Cayenne, QX70/FX, first-gen SRX. Rumours are swirling about a new Cadillac flagship, too, that will resemble the Escala concept (including being a hatchback) and have a pure electric version. 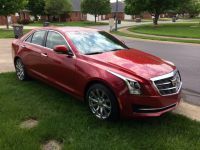 Cadillac ATS and CTS are the wrong product for the band of Cadillac, so thier failure are unavoidable. Trying to build a sporty Cadillac is a wrong approach for the band, people buying sporty car will not likely go to Cadillac stores. More today’s Cadillac tries too hard to build an American version of European sporty sedan, sector is dominant by three German bands. Even Lexus, Infiniti, Jaguar, Volvo, Acura and Alfa Romeo are struggling. American buyers are looking for luxury and gadgets than good handling cars __ both ATS and CTS are quite good handling vehicle, but it does not matter, even BMW tunes down its vehicles and goes for luxury. Mazada 6 and 3 Ford Fusion, Forcus and Festiva, Acoord Sport, Camry SE and VW Golf and GTI are good handling cars but not popular for US buyer. Traditional American luxury car buyers are dying. Today’s buyers grew up with Toyota and Honda. They may be foolish to buy hard riding cars but that’s what they’re doing. Just build a lineup Escalades already and stop this 40 year old charade. Escalade convertible, Escalade hatchback, Escalade Gran Coupe, Escalade 2.0T…..
I’m not surprised. But let’s be real here, Cadillac has six sedans, two of which are performance models, and the market isn’t heading that way. It makes sense that they need to trim the fat and the ATS is fat. Although, I’m also surprised why Cadillac has yet to axe the XTS. We have the CT6, which I understand isn’t a strong seller, but it’s another full size sedan that’s much fresher and newer, the XTS has little point anymore. My only guess is that the XTS sells better than CT6. As for why the Coupe version still remains, I would assume that Cadillac wants a two door only car to sell, since that’s one thing lacking in their department, but considering the decline of sedan sales, I can’t imagine what coupe sales must be like, so that kind of thinking makes little sense. The XTS will be gone soon, and not a moment too soon. I know it was kind of a stopgap model, developed because the original Zeta flagship plan was scrapped and Cadillac was down to just 1 sedan by 2012 and the Omega platform was just a glimmer in GM’s eye. And I know it has strong fleet/livery sales. But it lives to cannibalize CT6 sales and it is a vastly inferior car. I’m surprised they even gave it a facelift this year — time to give it the boot! Apparently the new CT5 will come with a coupe variant but the smaller Caddy won’t. I do envy the Germans and their perennial success in this market. It allows them to develop such a staggeringly diverse lineup of cars. Even something as simple as Mercedes having a coupe variant of each of their three main sedan lines is something remarkable which the Japanese and the Americans can’t replicate. The domestic ‘three-box'(that’s sedan to most folks) has proven it simply cannot keep up with the Japanese ACA three-box onslaught of the last twenty-plus years. That’s why Ford plans to drop most car models, and GM might follow. The market for those Japanese cars is dying, too. The Japanese still sell okay because their longtime customers are younger and are still in the market. But they’re reducing. Younger customers buy crossovers not sedans. I grew up around real Cadillac’s. The market has definitely changed since then. If a sedan is to be in Cadillac’s lineup, why not make it a no apologies big traditional Cadillac. I’m not talking 1976 ground hugging barge, but if they can build an over weight Escalade, they can build a proper Cadillac sedan, and I think it would sell better than the ATS. And this is every second car enthusiast’s suggestion for Cadillac, and I’m still not convinced it would work. You said it yourself: the market has changed. So why, instead of meeting other luxury brands head on, would it be worth taking a huge risk to do something completely different? I mean, I see your point… I think of how the Chrysler 300 revived the rear-wheel-drive, V8, American, full-size sedan, and part of that was due to its bold styling. But the luxury car segment is a far, far tougher segment to crack with some very entrenched loyalties and specific buyer expectations. William, I don’t think the CT6 has a V8, at least not for 2018 according to their site. There’s a 4, a 3.6l V6 and a 3.0l twin turbo V6. Power isn’t the issue though. Edit: I just saw that for 2019 there will be a 4.2 Twin Turbo but since it appears to be the V-Sport version and produces 550hp and 627lb ft of torque it’ll likely cost an arm and a leg and not sell very well. The issue is that if you can afford that, then you can likely also afford the entrenched players that you DON’T have to explain to your friends, neighbors, and/or clients. Cadillac in the US has lost its reason for being (beyond the Escalade, and that vehicle likely does as much harm as it does good for the rest of the brand). For the younger buyers, for the most part it’s simply not desirable or aspirational. And for the older buyers it’s not what a Cadillac was in its glory days. I was very taken by the early publicity of the CT6 but when I actually looked at one at the Denver Auto Show a couple of years ago I liked the exterior styling but found the interior materials lacking. It’s impossible to explain, but I could see/feel/sense it. The interior on the Hyundai Genesis (G70?, G80? whatever it was) was notably better done. And the Germans are better as well. I’m not saying it was bad but it was far closer to the Chrysler 300 than the “top tier” it should be. It should have launched with a V8 in a “normal” model from the beginning A higher price would be OK but not astronomical, maybe $10k more than a Chrysler 300C V8. Cadillac, to have any chance of catching up, needs to stop trying to follow and be a better German car and instead do its own thing better than others. Just like a Hyundai Sonata and a Kia Optima are quite good cars and probably comparable to Camry and Accord, they just don’t have that last little bit. Same thing here. Wow, some comments here are way off. first off i can’t believe or understand why some here put down the Escalade when in all truth other than being a 4 wheel drive vehicle is the closest thing to a “true” Cadillac. It is their best selling vehicle! as far as it’s Suburban connections…………So what??? It looks like a Cadillac, it’s optioned like a Cadillac, it drives and feels like a Cadillac and i repeat……it sells because it’s a true Cadillac. The underpinnings are tried and true. And as Steve mentioned above about BMW, I too have had and currently have an E46 and yes they are reliable, but things start to fall apart after the lease is up in all areas. And expensive as all get out to repair. Cadillac needs more vehicles with the aggressive look at me attitude that Caddy’s of yore have always had and i for one, other than the Escalade am tired of the Art and Science look. Eddie, if the Escalade is a true Cadillac, then it is because badge engineered Chevrolets lie at the heart of every Cadillac in your memory. Since 1959, GM shared the big bodies among all lines. Even the El Dorado of 1967 was a repurposed Toronado, albeit vastly re-engineered. 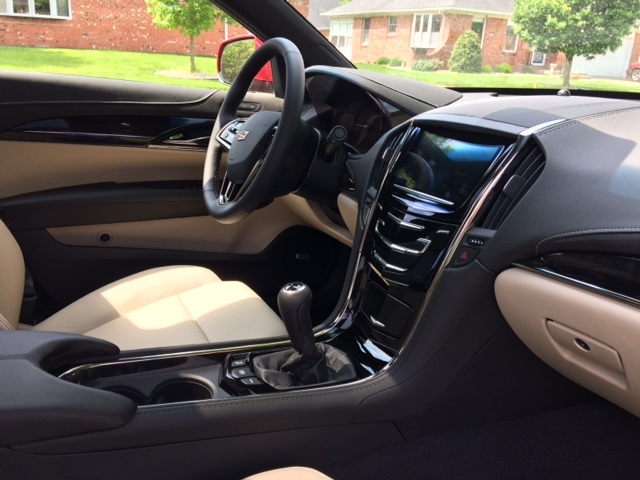 Now, the XTS is a top trim Impala, the Escalade is a Denali Tahoe with wreath and crest, and neither has anything available that one cannot option on the equivalent Chevy. The addition of the new V8 will not make a difference on the CT6, either, as the people buying them don’t understand or care about the difference in it and a LS6. The Camaro has the magnetorheological damper available, same as the Caddy. There is no exclusivity or special design flair at Cadillac, and that is why people are sick and tired of Cadillac and GM. Hell, you even say you own a BMW. You must have bypassed leasing or buying a CTS or ATS or CT6 when you last purchased. When the people who admire the brand don’t buy, how do you expect those who don’t admire it to buy one of their vehicles? I love Cadillac, my pops owned an 81 Coupe Deville and I was always a fanboy… Which is why it’s so aggravating that GMillac can’t figure anything out… Ever. They are always chasing a last generation BMW. Why did I sit in a CTS at the auto show and felt the same materials as my Sonata? In 40 years what has changed besides building even bigger badges to glue onto Chevy grills? I may have missed someone else mentioning it but the ATS also was one of the last luxury sedans available with a manual transmission. Below is proof: a good friend just took delivery of this special ordered ATS with manual a few days ago. He saw it as a last opportunity. The discount off sticker price was substantial, as it should be given how poorly this car has been selling. I bought a new 2017 ATS last June. Test drove the Ats, Cts, and the Xts. Didn’t see much difference in any, so I went with the cheap one. Literally gave away my pristine 02 Deville in trade, but with dealer incentives, did ok. I don’t know how the competition drives, but the ATS is still a Cadillac. Fit and finish is flawless, at least on the car I got. People ask me why I bought the smaller Cadillac. Two reasons, I’m a cheapskate, and I’m not running a jitney service. I don’t need the couple inches of more legroom in the back seat, the only items differentiating the three sedan models. The ATS is the smaller 62 series of years back. Same look, but a tad smaller.